Where do we find Flores and Komodo in Indonesia? The Komodo National Park in Indonesia consists of three main islands (Komodo, Rinca and Padar) and several smaller islands. 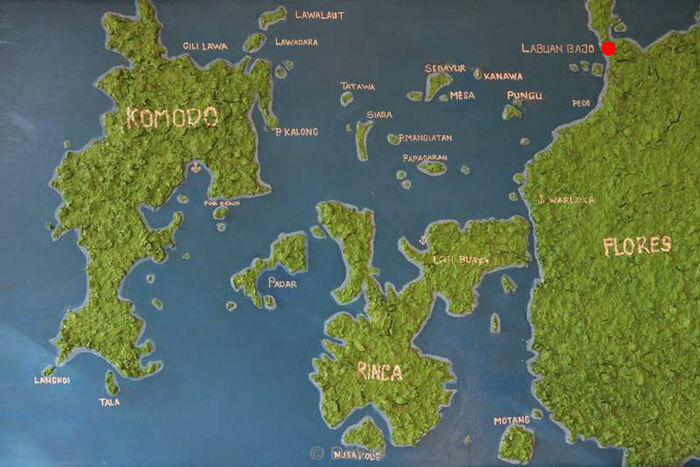 Komodo has an acreage of circa 390 km2 and approximately 2000 inhabitants. Since 1986, Komodo Island is listed on the world heritage list of UNESCO on behalf of the protection of the world famous komodo dragon and its environment. The landscape of Komodo is hilly, mountainous with a large savanna with Palmyra palms and large grass areas. The Komodo National Park is primarily known for the presence of the special komodo dragon, which is one of the oldest animal species in the world. An adult dragon can get up to 3m long and 160kg. The komodo dragon seems rather slow at first, but it's the opposite. When the animal is in attack, it's remarkably fast. This prehistoric beast isn't afraid of us humans, and its bite can have deadly consequences. Hikes on Komodo and Rinca Island are therefore only permitted in company of a professional ranger. Flores is one of the largest islands of Nusa Tenggara, the little Sunda islands in Indonesia. The number of inhabitants on Flores is estimated to be about 3.5 million. The landscape of Flores is characterized by volcanoes, some beautiful crater lakes, savanna areas, mountain forests and mangroves. In addition, the island is surrounded by many very beautiful dive sites. Despite all these natural treasures, Flores is one of the least visited islands of Indonesia. The Kelimutu National Park is considered to be one of the highlights of Flores. The 1,690 meters high volcano Keli Mutu has three crater lakes, that due to their minerals each have a different colour. Over the years, the crater lakes even changed colour several times. The area between Flores and Komodo is an ideal dive site, since there are many striking coral reefs inhabited by many and varied marine life. The visibility in the diving areas, on average is 15 to 40 meters. The amount of plankton can in the southern part sometimes limit the sight to only 5 to 15 meters. From April to November, diving in the southern part due to the strong winds and rough seas often isn't possible. During the other months, it's partially reversed. At the end of October, the seawater in the north remains 25°C to 27°C, but the deeper you go, the colder the water currents get (sometimes to only a few degrees). On several places in Flores you can go drift diving. Experience with such dives is therefore recommended to be able to admire the most beautiful dive sites. When diving with strong currents, a tide scheme is used. During diving on Flores and Komodo in Indonesia, you see a lot of corals with beautiful colours, including enormous table corals, gorgons, soft corals and crinoids in all colours and sizes. At times, it seems like an aquarium full of many colourful reef fish, frog fish, parrot fish, rays, tune, dolphins, sharks, etc. During the diving, you should also search for the beautiful bottom dwellers and hidden life, such as colourful nudibranchs, crabs, shrimps, mantis shrimp, comatulids, sponges, sac-like ascidiacea, etc. Most of the Indonesian islands make for a picturesque and rich marine life. Also, Flores and the nearby islands Komodo and Rincon for many divers are high on their to-see list. In addition, the presence of the prehistoric komodo dragon offers an extra attraction. To get to Flores, as a diver, you need to be willing to spend a lot of hours on the plane. We travel from Amsterdam with Qatar Airways to Doha, a relatively short flight of six hours. Then it's another nine-hour flight to Jakarta, the capital of Indonesia. As expected, Qatar Airways provides good service. The cabin staff is friendly, we have plenty of legroom, the films selection is more than sufficient to keep us entertained and there's certainly no shortage of snacks and drinks. Around 15.30pm local time we land on the international airport of Jakarta. Since we're no longer able to take a connecting flight to Flores today, we're obliged to stay a night in the well-kept Ibis Style hotel. When we step outside the airport, we immediately start the search for a sign that leads us to the free transfer bus to the Ibis Hotels. Unfortunately, we don't see any signs and the numerous officers and soldiers, with their poor English neither can help immediately. After waiting in vain at the 'pick up area' for 30 mins, we decide to take a taxi to the hotel. Since we have no idea how far or how long the drive is, we're fooled straight away. As we pay 200,000 RP (about 12.50 EUR) for a ride that really should only be 50,000 RP. However, we get value for money, because road works (yes, a burden they have here too!) we drive with a detour and on the way, get to see a lot of the local pursuits. Most people here live very primitively, in very poor houses and the waste (mainly including plastic) is simply burned on the street. Apparently, they've never heard of pollution! At last, around 17.00pm we get to the Ibis Style hotel and plump down on the comfortable bed. The room is spacious and the bathroom isn't bad either. Even though, we were more than well fed on our flights, we decide to have a small bite at the hotel restaurant. We make the most of it and stuff ourselves, but our taste buds must need some time to get used to the spicy dishes. Especially the small green peppers set our mouths on fire! After a good night's sleep, invigorating shower and well catered breakfast, we are ready for a new adventure and around 8.30am take a taxi (50,000 Rp) back to the airport of Jakarta. We depart from Terminal 3, a brand-new building where all travellers can make use of free Wi-Fi. Always convenient! The Garuda flight from Jakarta to Labuan Bajo in Flores is carried out with a smaller device and takes about two hours. When we land, the tarmac is still wet from a heavy shower. We clearly are in the transition of seasons and the sultry hot air drops like a wet mop on our shoulders when we leave the airplane. Outside, the driver of the Puri Sari Hotel is waiting for us and after 10 minutes we reach our final destination, where we'll be welcomed with a refreshing drink. All hotel staff is very friendly and makes every effort to make our stay as enjoyable as possible. Our spacious room has a very large, comfortable bed with mosquito net and fortunately, the air conditioning is just powerful enough to cool down the room sufficiently. The bathroom is very spacious and the shower has a powerful jet. Unfortunately, the window doesn't close fully, thus causing a humid bathroom all day. Showering with cold water is definitely recommended! After we have dropped off our luggage in the room, we make a short tour through the Puri Sari Hotel. We walk through the garden toward the swimming pool and the beautiful beach, which is provided with some sun loungers and bean bags, available to the hotel guests. Around 16.00pm we're meeting the German Liza of Orca Dive Club Flores at the Puri Sari Hotel. Of course, we first settle the necessary administrative formalities and then she gives us some more information about the various dive sites. She explains the extra fees that are charged daily; as the standard price (235 EUR for 10 boat dives) applies only to the diving on the house reef. The most beautiful diving places are a bit further away and are usually attached to a national park, where additional fees must be paid: 277,000 Rupiah per day for a diver and 167,000 Rupiah per day for a snorkeler. Furthermore, divers for a further destination are also charged 20 EUR extra per day to compensate for the higher transport costs. These additional costs have a significant influence on the originally calculated budget and the fees must be paid in cash Rp. Withdrawing enough cash is therefore the message! Extra Diving (20 EUR) and snorkelling (45 EUR per day) may be paid to Liza in cash EUR at the end of the dive period. After we watched a beautiful sunset, we go to the restaurant that serves a wide selection of local and European dishes. About the price, you don't have to worry, as it's not even 5 EUR for a main course! Then we prepare our dive equipment for the next day and go to bed early, as from tomorrow we'll follow another Spartan dive regime! At 6.00am the alarm goes off. We sigh out loud and reluctantly get out of bed. When we open the curtains, we see a clear blue sky and no wind, not even a breeze. It promises to be a hot day! We brush out teeth, quickly freshen up and then make way to the breakfast buffet where we get rid of our little sleepy eyes with a cup of strong coffee or tea. The offer of food is quite extensive, ranging from a freshly baked fried egg, pancakes, fruit, local hot dishes, etc. There is even a jar of Nutella for the spoiled tourists, devoted to their daily toast and chocolate! Just after 07.00am Liza picks up us with a rather rickety bus at the hotel. It just fits 10 people, which is also the number of participants of this diving adventure. After 15 minutes, we arrive at the harbour of Labuan Bajo, where we get on-board the boat of Orca Dive Club. It's a pretty worn-out, open and traditional wooden boat of 18 meters long and 4 meters wide, which can carry up to 15 divers and 5 crew members. The cruising speed is 8 to 9 knots. There's a basic toilet (without water reservoir) and unlimited water, coffee and tea available. In the afternoon, we're served lunch consisting of some traditional Indonesian dishes and there are biscuits and fresh fruit distributed among the divers. The crew is very helpful, but their knowledge of English is rather limited. The two dive masters thankfully speak English very well. The lower deck is fully equipped for diving and on the covered deck there are a few mattresses on which you can relax. It certainly isn't a luxury yacht, but as long as we can make some memorable dives, we can't complain. Today we dive on one of the more distant dive sites in the region, which means that we'll be sailing for about two hours to get to the dive spot. Time enough to get some more sleep and get acquainted with our Dutch and German diving partners. Siaba Besar Mooring on the left side consists mainly of sand that gently slopes down. Here you'll find especially macro life, such as snake eels, gobies, nudibranchs, different types of small colourful crayfish, etc. We even see a few rays. On the right side of Siaba Besar Mooring, there's more hard coral with the corresponding reef fish. Under the plateau coral you'll find some chilling crocodile fish. On the right side, you'll regularly come across several large turtles stealing the show. The maximum depth is 20m and on this dive site, dives are usually shallow. An ideal place for a check dive or a last dive of the day. There is hardly any current. This is a stunning dive site! There's an incredible amount of intact hard and soft corals. There are many reef fish present in such a way that they almost literally jostle. You'll experience the sensation of swimming in a crowded aquarium! Between the coral, you'll regularly admire turtles. In the blue, you continuous dive upon large schools of various types of fish. Of course, the predatory fish such as the white tip and black tip sharks aren't far away. Turtles, Napoleon Fish, groupers, tunas, giant trevallies, horse mackerels, barracudas, etc. are only a fraction of all you can see. The big disadvantage of Batu Bolong Nord is that there's a very strong current. Sometimes your regulator is almost literally pulled out of your mouth. You must be a very experienced diver to stand this natural force. It's also advisable to dive without a camera and a reef hook ready, to help you move against the strong currents. In return, you'll be presented one of the most beautiful diving places in the world, with huge quantities of fish and beautiful hard and soft corals along its walls. The maximum diving depth is +40m. Tatawa Besar consists of a gently sloping bottom which is full of gorgeous hard coral; occasionally you'll come across some soft corals. There're many different types of reef fish and if you're lucky, you can find an octopus hiding in the holes. It's therefore important to during the dives regularly look into the depth. On this dive site, you can also find white tip and black tip sharks; as well as turtles and mantas. The maximum diving depth is 40m. After the last dive, everyone gets seated on the upper deck and we start our way back to the hotel. When we enter the port of Labuan Bajo around 17.30pm dusk kicks in. On Sunday, the boat crew of Orca Dive Club usually wants to take it a little slower, and for that reason we'll only make two dives on a dive sites a bit more than 1.5 hours sailing from Labuan Bajo. These dive sites are just out of a national park, ensuring today's fee 'only' to be 100,000 RP. At the deepest part of Sebayut Kecil we dive on a sandy bottom with here and there a nicely vegetated rock block. Here, we see especially sand eels, snake eels, glass fish, scorpion fish, razor fish, boxer crabs, nudibranchs, and other macro life and many different types of reef fish. From 20m to the surface, the soil is completely covered with many types of colourful coral. It's a simple, but also very beautiful dive site, which is also suitable for snorkelling. The maximum diving depth is 25m. On Sebayut Rock it's normally always possible to dive behind a large rock in its shades, but not today. Apparently today is an exception to the rule, because we start our diving against the currents. After fighting against it for a while, our dive guide thinks it's been enough and decides to drift along. But when we reach our starting point, the current apparently has turned 180� in a very short period of time. It feels a bit as if they've opened a sluice at very high speed. All right then; return ticket drifting! Sebayut Rock is a dive site that gently slops, completely covered with many types of coral. The colourful reef fish complete the picture. The maximum diving depth is 18m. Today Orca Dive Club follows the manta-map, as we'll sail to three dive sites where the chance on seeing these graceful animals is very big. Again, we sail for about two hours to our final destination. The day before yesterday we already dove on Tatawa Besar, but today we are dropped at another point. Again, we see a lot of hard and soft corals with accompanying reef fish; it remains a fascinating spectacle! We dive on a sandy bottom that from a depth of 6m slops down to 45°. At 12m depth we can admire several coral blocks, as well as the macro life that's present. Unfortunately, we don't see any mantas today. The maximum diving depth is 20m. On Karang Makasar - Manta point, most the coral is totally destroyed. The gently sloping bottom shows only here and there a small block of coral. The current is extremely strong, making it almost impossible to hold a large camera. A reef hook is therefore absolutely necessary. Consider the sea urchins and scorpion fish on the bottom. However, our effort is well rewarded, as we see seven different manta rays, who regularly return to take a closer look. They literally make eye contact, remain close above our heads and some even hit us slightly. Their skin has the same structure as hard and thick leather; what an incredible experience! The maximum diving depth is 20m. When we arrive at the Mauan, we're welcomed by two manta rays of about three meters in diameter, that fully jump out of the water. Wow, we've never seen something like that before, and that of course causes high expectations! Mauan consists of a gently sloping sandbar, which again is covered with coral. We see a lot of types of reef fish, nudibranchs, mini-shrimps, Leaf Fish, bamboo sharks, white tip sharks, black tip sharks, and much more. But the main attraction of Mauan is, of course, the manta cleaning station. We see a total of seven different mantas and at the end of the dive a group of four mantas keeps circling around us for about half an hour. What a spectacle! We're on to the last bit of air of our bottles, and stay as long as possible to admire these wonderful animals. Eventually, we must inevitably make an end to this beautiful friendship. The maximum diving depth is 25m. GPS localisation of Mauan -8.556478, 119.6 31716. Penga Kecil North is located two hours sailing from Labuan Bajo and is actually nothing more than a little rock in the sea. In the event of a change in tide diving takes place on the south side of the rock. The bottom tilts 40° downwards and is completely covered with very pretty coral. Among others we see many colourful reef fish, turtles, white tip reef sharks, octopus and coral reef snakes, but there're also nudibranch, crabs and other macro life. The maximum diving depth is 40m. Wynilu consists of a soft slopping sandy bottom where especially macro life is present. Here, we see among others nudibranch, squid, different types of rare crabs, shrimps and ghost morays. At dusk, there're also a lot of mandarin fish to admire. The maximum diving depth is 25m. Today, we only make two dives, as this afternoon, after the lunch, we've have planned to visit the Rinca Komodo National Park, where's said the ancient komodo dragon lives. When we get off the boat, the heat is a burden on our shoulders. It promises to be a sweaty trip! The entrance for the Rinca National Park is 115,000 Rp per person. Furthermore, there's a fee of 80,000 Rp per group of up to four people for the guide. This ranger also guarantees the safety of the visitors, may a komodo dragon attack you. For this reason, it's neither allowed to walk around the island, without any guidance. We've only just left or already spot a group of komodo dragons in the shade of the kitchen. Although, the animals aren't fed, the smell of the food attracts them and makes them usually wanting to laze in front of the kitchen the rest of the day. Apparently, the dragons only eat one extreme copious satisfying meal per month for which they need the rest of the time to digest. Only in the early morning they're active, the rest of the day they chill and relax in the shade and hardly have eye for the attention of the many tourists who want to capture them on their photographic plate. On Rinca Island you have the choice of a short, medium or long trek We choose the medium hike and during our walk through the arid, dry landscape we encounter at least two buffalos, some deer and a few long-tailed macaque monkeys. All in all, this trip is a little disappointing experience because the scenery is far from spectacular and the guides do little to no effort to spot the animals. On the contrary, they consciously keep the pace high and give the impression that they'd want to end the walk as soon as possible. Only when the group asks questions, they give some more explanation. Fortunately, at the end of the trip awaits a nice surprise. In the middle of the hiking trail, there's a male komodo dragon and he's in no rush to move. All cameras can eat their heart out, and after everyone has taken the necessary photos, the guide chases the dragon back into the forest. At last, we've seen a komodo dragon in action! After the visit to the island Rinca we get back on the boat of Orca Dive Club and sail back to Labuan Bajo, where we set foot on land around 17.30pm. This is our last diving day on Flores. How the time flies! Today we set course towards the more distant dive sites and with Orca Divers Club we sail for more than three hours to our destination. On Cauldron, we make a channel dive between two islands, where the current can be very strong. From the Islands the sandy bottom gently slops down to a depth of 18m, where you can also find some rock blocks. Under the sand, you may see rays; it's therefore important to be aware and not touch the bottom. The white tip reef sharks, black tip reef sharks, grey sharks, turtles and mantas are delighted and feel at home in the strong currents. The edges of the islands are covered with beautiful coral and there are various types of reef fish. Here, less experienced persons could possibly do some shallow diving. When we jump in the water, the current is at its weakest point. After a few minutes, the current comes up strongly, and we're obliged to attach our reef hook to a solid rock. At the end of the dive, the current is that strong that we fly like Superman through the channel. Great fun, as if we're in an amusement park! The maximum diving depth is 30 m.
Chrystal Rock is a pinnacle rising from the bottom of the ocean to a meter above the surface. The direction of the current determines where the divers are dropped. From then on, it's important to immediately descend at high speed because otherwise you'll miss the pinnacle of Chrystal Rock and must instantaneously conclude the dive. A reef hook is necessary to be able to hang on. We look full of admiration in the blue, watching the big schools of fish, that sometimes form genuine fish balls, on which tunas, sharks (grey, white tip and black tip reef sharks), giant trevallies, horse mackerels and other predators hunt on. On Chrystal Rock, there's an incredible amount of fish! The dives end in the shade on the other side of the pinnacle, where there's significantly less life and coral. The maximum diving depth is 40m. Today we do a small experiment and dive with the reef to our left shoulder, instead of to our right. As long as we stay in the shallow parts, we see beautiful coral, but when diving in the deeper parts, there's a lot of broken coral and several shabby sandy areas. We dive on a gently sopping soil and mainly spot nudibranchs, several crabs and shrimps, reef fish, white tip and black tip reef sharks, turtles, rays and at last a manta. The maximum diving depth is 40m. Chill day! Today we finally sleep in and can enjoy our breakfast without keeping eye on the clock. The temperature rises above 30°C again, so we go for a walk along the beach, the only place where there's a light breeze. We have the beach all to ourselves. What a blessing! Furthermore, we fill this relaxing chill day with some jumps in the pool and a lot of lounging and lazing. Around 15.00pm, Liza of Orca Dive Club delivers our diving gear washed and dried at the hotel. We are also presented the final bill, which is kind of a bitter pill to swallow, as we're charged 180 EUR extra on the originally purchased diving package of 235 EUR. For five days snorkelling we're charged EUR 175. You could pay these bills in Rupiah, but keep in mind that there is a less than favourable exchange rate. Around 17.30pm we go back to the beach to enjoy the wonderful red-hot sunset for a last time. Gorgeous! Since our flight to Jakarta doesn't leave until the late afternoon, we're left with a lot of time which we can use to relax and enjoy the stunning views of the tropical garden of the Puri Sari Hotel. After lunch, the hotel shuttle drops us off at the small airport of Labuan Bajo. As we always calculate a wide margin of time for unforeseen circumstances, we have plenty of time to take part in a local survey on the tourism in Flores. Apparently, the island wants to start a competition with Bali and lure future tourists Flores instead. In that case, they've a lot of work to do, as at this stage the island offers very little attractive accommodations that meet the western standards. The town of Labuan Bajo neither invites for a great night out. In any case, we contributed by mentioning that they need to lower their tourist taxes. The two-hour flight to Java goes as planned and at nightfall, we land on the busy airport of Jakarta. From the last time, we know that the taxis here calculated way too high fares. We try to negotiate with some of the drivers to get to the hotel for 50,000 RP, but they don't buy it. Ultimately, one of them is willing to make the little ride for a 100,000 Rp. At least that's half of what we have paid the first time! We spend the night again in the Ibis Style hotel, which offers fairly good quality for a reasonable price. One more night, and then we can start our next diving adventure on Christmas Island! Malaria is present in Flores Komodo in Indonesia. Malaria is transmitted by mosquitoes. That's why protection against mosquito bites in Flores Komodo in Indonesia is very important. Malaria mosquito mainly bite at night and early in the morning. Always wear protective clothing with an anti-repellent sprayed with deet. Protect your uncovered skin, with an insect repellent with sufficient deet. In risky areas, sleep under a tightly sealed mosquito net and make sure it's pushed well underneath your mattress. If you get feverlike or flulike symptoms during or after the stay, always contact your doctor directly and tell the doctor that you are or just have visited a malaria area in Flores Komodo in Indonesia. Dengue (also called knock fever) is caused by the aedes mosquito (Asian tiger mosquito) that occurs during the day (especially at sunrise 09-11 hours and sunday 13-17 hours). Dengue is a viral disease. Symptoms of viral disease dengue are: start to start with fever, headache and joint pain (tuberculosis), major muscle aches (including lean aches and pain around the eyeballs), which explain the stiffness of the sick. Sometimes there is a dry cough, and the heart rate is relatively slow relative to the fever (relative bradycardia). Classical (but not always!) Progresses the disease according to a biphasic pattern: after 3 to 4 days fever occurs a transient improvement, around the 5th to 6th day the fever rises again. At that time, a red flaky skin rash (similar to measles) may appear. After a few days, the fever disappears, but there may be a long period of difficult recovery, characterized by asthenia, muscle aches and allergies. There is no specific treatment, the condition heals itself. One should not use aspirin in the treatment of dengue fever, but only paracetamol for fever. However, there is no specific treatment or vaccine for the viral disease viral disease. Always consult a doctor immediately. Chikungunya is spread by the aedes mosquito (Asian tiger mosquito). The aedes mosquito (Asian tiger mosquito) bites during the day (especially at sunrise 09.00 - 11.00am and at sunset 13.00 - 17.00pm). Chikungunya is a viral disease. Symptoms of the viral disease Chikungunya are: high fever, flulike symptoms and usually accompanied by striking to violent joint pain in the ankles, wrists and/or fingers. Other possible symptoms include swelling of the hands and/or feet, skin rash, light bleeding (gum). The precautionary measures are: an insect repellent spray with deet, sleep under a mosquito net and wear protective clothes with long sleeves at night. Aspirins as a treatment of Chikungunya are forbidden, only use paracetamol for the fever. However, there is no specific treatment or vaccine for the viral disease Chikungunya. Chikungunya is present in both urban and rural areas. Always consult a doctor immediately. The zika virus is mainly transmitted by the tiger mosquito (Aedes mosquito). Usually the disease is asymptomatic. Some have flu-like symptoms, others seem to have dengue or chikungunya. The zika virus can also be transmitted to an unborn child and thus cause abnormalities. Therefore, pregnant women are advised not to travel to countries where the zika virus occurs. The zika virus can also be transmitted through sexual contact or via blood transfusion. To date, there is no vaccine or treatment for the zika virus. For protection you should use an insect repellent spray with a high DEET percentage, sleep under a mosquito net and wear long garments at nightfall. If you want to become pregnant after you have visited a country where the zika virus occurs, it is highly recommended that both partners get tested first. In specific circumstances vaccination against rabies and meningococci acwy meningitis should also be considered. All of this should be discussed individually with your doctor or the doctor of a travel advice center. You may experience severe diarrhea and associated cramps. Imodium only eliminates the symptoms, but not the infection itself. If the diarrhea is also accompanied by a fever, you should consult a doctor and have antibiotics prescribed. Drink as much bottled water or boiled water as possible. Always peel the fruit before eating and avoid eating raw greetings. It is absolutely necessary to always use a sunscreen with a high protection factor. The UV index is much higher on Flores - Komodo in Indonesia than in Belgium. Even on cloudy days, it is important to protect your skin from sunburn. Be sure to use an extra high protection factor for trips on the sea, where the sun is reflected extra. A good pair of sunglasses to protect the eyes and a cap should not be missing here. On Flores and Komodo Island there is a monsoon climate from November to April with strong, short and abundant rain showers. The summer season runs from April to October; August and September are the driest months. The annual average temperature in Flores is 29°C on the coastal areas. In the interior the average temperature is between 20°C and 30°C. On the tops of the volcanoes it is remarkably colder. 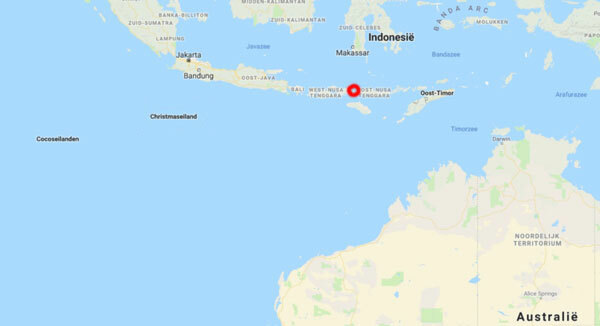 The average water temperature in the Floreszee (around Flores) fluctuates between 27°C and 29°C; on the Indian Ocean side it is somewhere between 23°C and 24°C. During the Belgian summer time, it is 6 hours later in Flores - Komodo in Indonesia and 7 hours later in winter time. The speak Englisch. Bahasia Indonesia is spoken on Flores and Komodo Island in Indonesia. In addition, other languages are spoken on Flores, including the Manggarai, Ngadha, Nage, Ke'o, Endenees, Lionees, Paluees, Lamoholot, Sikka. 220V is provided in Flores and Komodo Island in Indonesia. The sockets and plugs are the same as in Belgium. It is customary in Indonesia to give a tip, if this is not already included in the bill. The usual amount varies from 5-10% gratuity. One US dollar per travel case. For the room a US dollar. Pay attention to showing money, jewelery, wealth and credit cards. For the rest stay out of back streets. Airy clothing and sturdy shoes when you make trekkings. In Flores en Komodo Island in Indonesia are a few other traffic rules apply than to us, eg they drive to the left of the road.